Louisiana Lottery Corporation began in 1991 after the 1990 state Legislature proposed a state lottery (ACT 1045) as a way to generate revenue without increasing taxes. Due to the Lottery's unique operations, the Legislature recognized a corporate structure would suit it best. Voters also liked the idea and passed a constitutional amendment in 1990 creating the LLC by a 7 to 3 margin. In 2011, the Lottery celebrated the 20th Anniversary of the sale of its first scratch-off on Sept. 6, 1991. 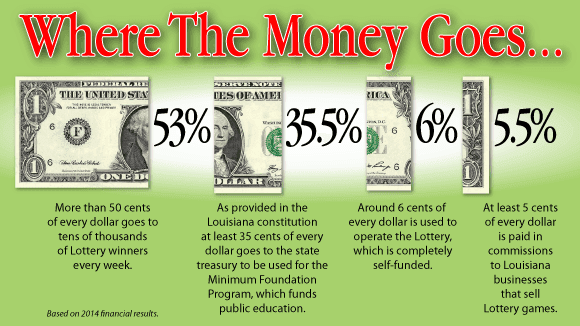 In 2003, voters passed another constitutional amendment to dedicate Lottery proceeds to the Minimum Foundation Program that funds public education in Louisiana. Public trust is paramount to the Lottery's success. To ensure the highest level of accountability, the following have varying degrees of oversight over the corporation, including its budget, drawings and administrative rules. In addition to an annual clean bill of health from the Legislative Auditor, the LLC continues to receive national recognition for excellence in financial reporting. 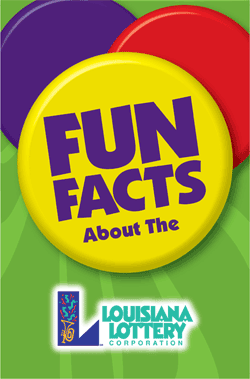 For a printer friendly version of an overview of the Louisiana Lottery, download our Fun Facts brochure. For more detailed and historical sales and state transfer information, see our 2018 Press Kit. To view, download, or print this file in PDF format, you must install the Adobe Acrobat Reader (free of charge) from Adobe's website. More than half of Lottery sales are reserved for prize expenses. Prizes not claimed are returned to winners in the form of increased payouts on scratch-off tickets. Players have won about $4.75 billion in prizes since the Lottery's inception. The Lottery statute mandates that at least 35 percent of all Lottery revenue be transferred to the state treasury. Effective July 1, 2004, the Louisiana constitution provides that Lottery proceeds be earmarked for the Minimum Foundation Program (MFP), which funds K-12 public education in Louisiana. In addition, the first $500,000 in annual Lottery proceeds is earmarked for the Louisiana Department of Health and Hospitals-Office of Behavioral Health to fund problem gambling programs. As of fiscal year 2018, the Lottery has transferred more than $3.5 billion to the state treasury. Almost $172 million was transferred from sales in fiscal year 2018. The Louisiana Lottery ranks second among other U.S. jurisdictional lotteries in percentage of revenue transferred to its government. Roughly 2,900 businesses in Louisiana earn five percent commission on the sale of Lottery products as licensed retailers. In addition to revenue from commissions, retailers earn an incentive of up to 2 percent for cashing winning tickets of $600 or less. 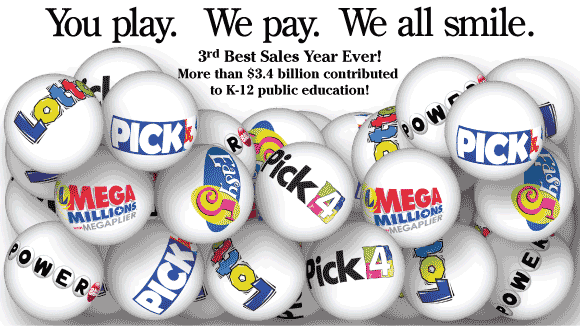 Retailers are also paid a selling bonus of up to 1 percent on the sale of winning tickets for Lotto jackpots; Easy 5 jackpots; Powerball and Mega Millions match-5 prizes (including Power Play and Megaplier winnings); and Powerball and Mega Millions jackpots (1 percent of Louisianas contribution to the jackpots cash value or a minimum bonus of $25,000). Retailer commissions, incentives and bonuses reached $27.5 million in fiscal year 2018, amounting to nearly $545.3 million since the Lottery's inception. The Lottery retains around 6 percent of its revenue to fund statewide operations, including its headquarters, five regional sales offices where players claim winning tickets, technology for generating tickets and conducting drawings, ticket printing, advertising, promotions and staffing. For the 20th consecutive year, the Louisiana Lottery received the Certificate of Achievement for Excellence in Financial Reporting from the Government Finance Officers Association of the U.S. and Canada. The Louisiana Lottery was also the first in the country to receive industry verification that its quality assurances meet best practices. The Comprehensive Annual Financial Report is created by the Louisiana Lottery Corporation at the end of each fiscal year, July 1st through June 30th. The Retirement Plan Comprehensive Annual Financial Report is created by the Louisiana Lottery Corporation at the end of each calendar year, January 1st through December 31st. Retirement Plan Comprehensive Annual Financial Report. Past annual reports can be found on theLegislative Auditor's Web site. To view, download, or print these financial reports in PDF format, you must install the Adobe Acrobat Reader (free of charge) fromAdobe's website. The Lottery has 125 budgeted positions, including both full-time and part-time employees, in its downtown Baton Rouge headquarters, distribution center, as well as regional offices in New Orleans,Lafayette, Alexandria, Shreveport and Monroe. Regional staff process and pay winning tickets and support Lottery retailers, including training, monitoring product inventory and point-of-sale opportunities,assisting with in-store promotions, resolving problems, explaining new games and changes and ensuring compliance with Lottery rules. Operational management functions, including sales, accounting, auditing, marketing and public relations, human resources, security and information systems, are conductedfrom the Lotterys corporate headquarters. The Lotterys distribution center oversees inventory management and instant ticket order fulfillment. The Lottery offers two types of games, scratch-offs and draw-style. Scratch-offs or instant tickets require players to scratch off a latex surface on the ticket to find out immediately if they have won. The Lottery introduces approximately 70 scratch-off games each year with varying prices of $1, $2, $3, $5 and $10. Ticket art, game design and prize structures are developed by Lottery staff. Tickets are printed by the Lotterys vendor, Scientific Games, under exacting quality control and security standards comparable to those in currency printing. As soon as all of the top prizes in a scratch-off game have been claimed, the Lottery immediately begins the process of pulling the game from sale. Games may also be closed when ticket inventory is near sell-out or at the discretion of the Lotterys president. To play draw-style games, players choose their own numbers or allow the Lotterys computers to choose their numbers and then wait for a drawing to be held to see if they have won. From time to time, the Lottery may also conduct raffle-style games with a set number of sequentially numbered raffle tickets for sale. The terminals used for draw-style games in retailer locations are part of a closed communications network with satellite in most locations, provided by Lottery vendor, INTRALOT. The INTRALOT gaming system cannot be accessed via the Internet or by the Lottery. This system is also separate from the Lottery drawing machine system. Current draw-style games include: Lotto, Easy 5, Pick 4, Pick 3, and two multistate games in which Louisiana participates: Powerball and Mega Millions. Louisiana law requires ticket purchasers to be at least 21 years old. Lottery products are sold through a distribution network of roughly 2,900 Louisiana businesses who comply with an extensive licensing process that includes compliance with the Americans with Disabilities Act and Louisiana Workforce Commission requirements and background screenings. Licensed retailers must display a sign indicating their status. Retailers earn a 5 percent commission as well as other incentives and bonuses on the sale of Lottery tickets. Retailers must also cash winning tickets valued up to $50 and are encouraged to cash winning tickets worth up to $600. 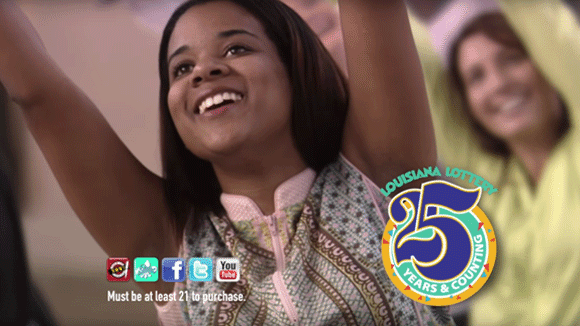 Here is listing of key milestone's in the Louisiana Lottery's history. Click for a general history of lotteries. October 6. Louisiana voters approve a constitutional amendment creating the Louisiana Lottery Corporation by a 7 to 3 margin. September 6.The first instant scratch-off game Louisiana Treasures goes on sale. January 22.The first draw-style jackpot game Lotto is introduced with a starting jackpot of $2 million. August 31. Pick 3 launches with daily drawings. September 26. The Robert H. LeBas Family Partnership of Church Point claims the largest recorded Lotto jackpot of $21,208,165. November. Cumulative Lottery sales top the $1 billion mark. May 8.The Lottery begins using automated drawing machines for daily Pick 3 drawings. March 5. The Lottery becomes the 19th lottery, of the now 47, to join the multistate game Powerball. The Lottery also begins offering Easy 5 until Oct. 1998. January 15. The Problem Gambling Helpline is launched by the state, and the Lottery adds the number to all tickets and advertising. February 14. Louisiana experiences its first Powerball jackpot winner with two more jackpot-winning tickets sold for the Feb. 29 and July 17 drawings. March 16. The Lottery begins offering the multistate game Daily Millions until April 1998. October 12.Cash Quest is introduced with drawings on Wednesdays and Saturdays. Drawings are increased to five days a week in May 2003 until the game ends in Sept. 2007. March 1. Pick 4 is introduced with daily drawings. December. Cumulative treasury transfers reach $1 billion. September 9. The Lottery begins offering the multistate game Rolldown until April 2002. March 4. The Power Play option is added to Powerball, giving players the chance to multiply nonjackpot winnings for an additional $1 per play. July 1. The Lotterys headquarters moves to its permanent building in downtown Baton Rouge. June. The Lottery begins participating in the AMBER Alert network through its retailers. October. Cumulative revenue tops the $4 billion mark. July 1. A constitutional amendment approved by voters takes effect to dedicate Lottery proceeds to the Minimum Foundation Program, which funds K-12 public education in Louisiana. August 29. Hurricane Katrina strikes the Gulf Coast, causing the loss of over 900 Lottery retailer locations, including 700 in the New Orleans area. September 24. Hurricane Rita follows, disabling an additional 300 retail stores in Southwest Louisiana. October 19. A record Powerball jackpot causes the Match-5 Bonus prize to kick in for the first time with three Louisiana players each winning $853,492. November.The Louisiana Lottery becomes the first North American lottery to receive industry verification that its quality assurance processes meet industry best practices. April 27. The Lottery conducts its $1,000,000 Spectacular Second-Chance Drawing live from five finalists entries. September 16.The Lottery relaunches Easy 5 with a starting jackpot of $50,000. December 17. The Lottery launches its Let the Good Times Roll scratch-off featuring the artwork of Louisiana artist Darrin Butler, who won the Louisiana JAZZ art contest sponsored in conjunction with the Office of the Louisiana Lieutenant Governor and the Department of Culture, Recreation & Tourism. January 16. Carl Hunter wins the single largest prize in Louisiana Lottery history, a $97 million Powerball jackpot. February 18.The Lottery launches its first-ever $10 raffle game, Millionaire Raffle. April. The Lottery Corporation receives the Certificate of Achievement for Excellence in Financial Reporting for the tenth consecutive year from the Government Finance Officers Association (GFOA). July. Cumulative Lottery transfers to the state treasury top $2 billion. January. Powerball's starting jackpot jumps to $20 million to make it the largest starting jackpot of any lotto-style game in the world. The Lottery partners with Louisiana music legend Al Carnival Time Johnson to celebrate his anthems 50th anniversary in conjunction with the promotion of its Mardi Gras scratch-off. June 30.The Lottery ends its fiscal year with the highest sales since 1993. September 8. The Lottery partners with the New Orleans Saints to launch the first-ever team-themed scratch-off game with a series of second-chance drawings for game ticket packages and autographed merchandise. Saints go on to become World Champions. December. The Lottery partners with the Zulu Social Aid and Pleasure Club to launch the first-ever Mardi Gras scratch-off game featuring a parade krewe brand. February 8.The Lottery launches its second raffle game, $1,000,000 RAFFLE. June 27.For the first time since start-up, the Lottery upgrades both its retailer terminal equipment and gaming system. November. Cumulative revenue tops $6.5 billion and cumulative transfers top $2.3 billion. February 28. The Lottery brings back the popular $10 scratch-off game Millionaire Bonus Raffle. April 4. The Lottery sponsors a T-shirt design contest to celebrate its 20th anniversary. July 11. Capitalizing on the popularity of alligator hunters and reality TV stars Troy and Jacob Landry of Pierre Part, the Lottery launches the $2 scratch-off game Choot Em. November 16. The Lottery introduces a new multistate game, Mega Millions, a $1 per play draw-style game featuring starting jackpots of $12 million. January 15.The multistate game Powerball undergoes several changes to produce bigger jackpots and better odds of winning, with the cost of a ticket increasing from $1 to $2. March 16.The Lottery receives the Certificate of Achievement for Excellence in Financial Reporting for the 14th consecutive year from the Government Finance Officers Association (GFOA). March 19. In commemoration of Louisianas bicentennial, the Lottery introduces the $2 scratch-off game Lovin' Louisiana 200 Years. April 3. The Lottery cooks up a new $2 scratch-off called Crystal Hot Cash, featuring Louisianas iconic Crystal Hot Sauce. June 30. 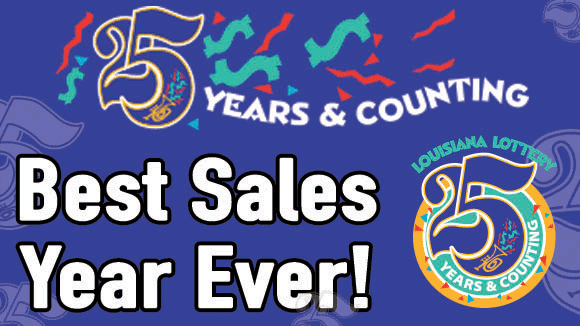 Louisiana Lottery sales top $400 million for the first time since 1993, with fiscal year 2012 sales of $429.6 million. The treasury transfer of $156.9 million for fiscal year 2012 is the Lotterys second-highest since inception. July 30. Entering into a strategic alliance with the popular hunting magazine Louisiana Sportsman, the Lottery launches a $2 scratch-off game by the same name. August 27. The Lottery launches its fourth New Orleans Saints-themed scratch-off entitled I LOVE MY SAINTS. February 11. The Lottery launches a MONOPOLY scratch-off game at the $5 price point after two successful $2 games earlier in its history. February 13. Looking to new technology to help increase its retail presence, the Lottery deploys self-serve vending machines called WinStations at 20 select retailers throughout the state. February 25. Recognizing the popularity of online video content, the Lottery launches a weekly YouTube talk show called The Big Deal. May 25. Louisianas 15th Powerball jackpot-winning ticket is sold in New Orleans. The $50 million prize is split with two other winning tickets sold in Delaware and Florida; The Williams Trust of New Orleans claims Louisianas portion. July 31. Fiscal year sales top $400 million for the second year in a row. August 5. The Lottery launches the $5 scratch-off BLACK & GOLD SAINTS, partnering with the New Orleans Saints for the fifth year. October 19. The multi-state jackpot game Mega Millions undergoes enhancements, including a higher starting jackpot, a $1 million match-5 prize and lower overall odds of winning, designed to create larger jackpots and more millionaires. December 16. The Lottery launches the first $5 Duck Dynasty-branded scratch-off in the country, with tickets featuring members of A&E Networks hit reality series. Jan. 1. Changes are made to the Power Play add-on feature of the multi-state jackpot game Powerball, with certain prize levels once again dependent upon a multiplier. Feb. 21. A brand new website is launched, offering players improved functionality, upgraded features and a clean, sophisticated design. March 1. To revitalize player interest in its flagship draw-style game Lotto, the Lottery launches Lotto Lagniappe, a four-month promotion offering bonus entries for monthly raffle drawings. April 11. For the 16th consecutive year, the Lottery receives the Certificate of Achievement for Excellence in Financial Reporting from the Government Finance Officers Association of the United States and Canada. June 30. Lottery revenue tops $450 million for the fiscal year and $161.6 million is transferred to the state treasury for K-12 public education, not including an additional $9 million transfer to the Louisiana Mega-Project Development Fund per a 2014 legislative act. The exemplary results land the Lottery in the top 10 state lotteries for instant sales growth in 2014. March 2.The Lottery launches a $2 Tony Chacheres themed scratch-off, featuring the creole seasoning brands iconic can and character. June 17.The Lottery launches an Instagram account as an effort to further promote its brand with visual updates and cultural happenings around the state. June 30.Lottery revenue tops $452 million for the fiscal year and $168 million is transferred to the state treasury for K-12 public education,not including an additional $20 million transfer to the Minimum Foundation Program from the Lottery's unclaimed prize fund and another $5.9 million transfer from cash reserves to the Lottery Proceeds Fund per a 2015 legislative act. August 10.The Lottery launches the $5 scratchoff SAINTS FEVER!, its seventh year partnering with the New Orleans Saints. October 1.The Lottery's $2 gameSpice It Up!is chosen as the Best New Instant Game of 2015 by NASPL. October 4.Changes are made to the multistate jackpot game Powerball in an effort to produce larger jackpots and better overall odds of winning. A 10x multiplier is added to the Power Play add-on feature for drawings with jackpots under $150 million. The match-4 plus Powerball prize jumps from $10,000 to $50,000. October 12.The Lottery launches the Retailer Portal website giving store owners 24/7 access to accounting, inventory and sales reports. January 13.The Powerball jackpot is hit at a record $1.58 billion, producing three Louisiana millionaires and $60.2 million in sales during its record run. June 30.Lottery revenue tops $500 million ($508.3 million total) for the first time ever during a fiscal year and $177.9 million is transferred to the state treasury for K-12 public education. August 8.The Lottery launches the $5 scratch-offSAINTS GOLD,its eighth year partnering with the New Orleans Saints. September 6.The Lottery launches the $525Xscratch-off to celebrate its 25th Anniversary. April.For the 19th consecutive year, the Louisiana Lottery Corporation received the Certificate of Achievement for Excellence in Financial Reporting from the Government Finance Officers Association (GFOA) of the United States and Canada. June 30.Lottery revenue tops $454.9 million for the fiscal year and $159.2 million is transferred to the state treasury for K-12 public education. August 14.The Lottery launches its ninth consecutive Saints-branded scratch-off game, SAINTS GAME ON! Oct. 25.A single ticket purchased in Eunice matched all six numbers to win a $191.1 million Powerball jackpot, the largest single amount won in Louisiana Lottery history. March 24.A single ticket purchased in Lafayette matched all six numbers to win a $55.9 million Powerball jackpot, the second jackpot win in Louisiana in just under five months. June 30. Lottery revenue tops $491.3 million for the fiscal year and $171.9 million is transferred to the state treasury for K-12 public education. Do Louisiana's border states have lotteries? Does the Lottery determine how proceeds are spent? Does the Lottery get any money from the state? Does the Lottery have a member's club? How does Lottery revenue and proceeds compare to other forms of gaming in Louisiana? How does the Lottery discourage underage play? How many people work for the Lottery? Is the Lottery meeting sales expectations? What does the Lottery do to promote playing responsibly? What is the Lottery's mission statement?